"And when He spoke to me, the Spirit entered into me and set me upon my feet; and I heard Him speaking to me" (Ezekiel 1:28-2:8). God's glory caused Ezekiel to fall upon his face. When God told him to stand up, he couldn't do it. Then the Holy Spirit entered him, and lifted him up on his feet. Then God spoke to him, and Ezekiel got the message - loud and clear. God sent him on the "mission impossible" to be the prophet for Israel, a rebellious nation who wasn't listening to Him. God granted Ezekiel the permission to address the crowds with the phrase: "Thus says the Lord God... (Ezekiel 2:4). 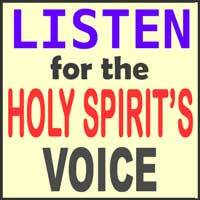 The Holy Spirit is the one who catches our attention and speaks to us about what God wants us to do. The Spirit "will not speak on His own authority, but whatever He hears He will speak; and He will declare (tell) to you the things that are to come" (John 16:13). He cooperates with God, our Father, who sits on the Heavenly throne. The Holy Spirit is "God inside of us," who stirs and lifts us up to get our full attention, making it possible to hear His voice. Holy Spirit, please lift me up and empower me to complete the "mission impossible" that God is calling me to do. Amen.